Upper back tattoos are seen in a variety of sizes and styles. This area of the body is often used for larger pieces of body art. The upper back offers a larger flat area of skin canvas that allows space for one big tattoo or several smaller ones. The darn things have wings! The shoulder blade area of the upper back is a popular place to have some wings inked. There are several types of wings that you may wish to consider for a wing tattoo. The shoulder area is also a good place to have a winged creature tattoo. Some people like to have their guardian angel permanently inked to look over their shoulder. Butterflies are very popular subjects for upper back body art as well. The upper back lends itself well to Asian themed tattoos such as Chinese writing, dragons or yin yang tattoos. Large colorful Koi tattoos are also well suited to upper back placement. Delicate Asian flowers such as the rare lotus and the elegant cherry blossom might be added to these themes when a feminine touch is desired. Dragons and floral themes may also continue down the back or arms for larger Asian tattoos. 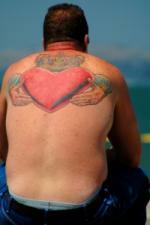 The large area of the upper back is often the location for a tribute to a big love in someone's life. This is often the spot the bearer of the tattoo selects for a portrait or memorial tattoo. It also lends itself to large colorful hearts, and banners big enough to write a whole love poem on. The name of a loved one may also appear with a religious symbol such as a cross or dove. Traditional tattoos such as skull and crossbones, Hawaiian or nautical themes, pin up girls, and religious themes all make great designs for upper back tattoos as well. Traditional themes also lend themselves well to being continued into a larger back piece if you plan to expand your tattoo in the future. Wash hands before touching a new tattoo. Wash the tattoo with anti-bacterial soap three times per day. Allow the tattoo to get air as often as possible. Once your tattoo is healed, protect it from the sun's damaging rays with sunscreen. Use one that has and SPF factor of 30 or above. The sun will fade your artwork, so even if you are using sunscreen you may wish to cover tattoos on your upper back limit sun exposure.